Dr Howard Alexander Bell created the Amber Nymph for fishing on his favourite water, Blagdon & Chew Reservoirs. As a successful still water and reservoir fly, it is one of the earlier 'bugs' created. 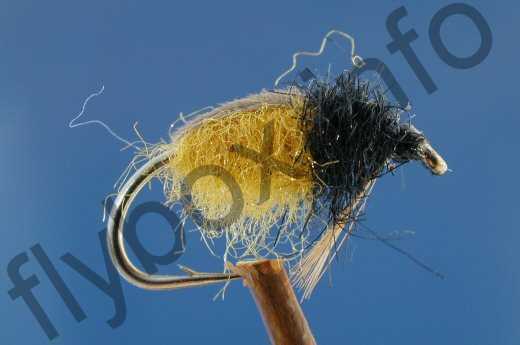 It seems to represent a sedge pupa which trout will take at various depths throughout the season. As a Doctor, H A Bell witnessed the appalling horrors of the 1st World War front line dressing stations. On his return to England he began Fly Fishing as a restorative and pleasurable pastime, preferring to fish alone. In the 1920s he developed imitative patterns nicknamed 'Bell's Bugs' which were very successful. His patterns came from imitating what he found in the stomachs of the fish he caught. Body : Amber seal's fur. Thorax : Dark brown ostrich herl or dark brown seal's fur. Legs : Fibres of a golden pheasant. The legs are tied on each side and are double the body length. Currently there are no comments about the Amber Nymph fly pattern from other fly fishermen yet.